Each work of art in the Women Series is based upon the image of a woman painted by a famous male artist. 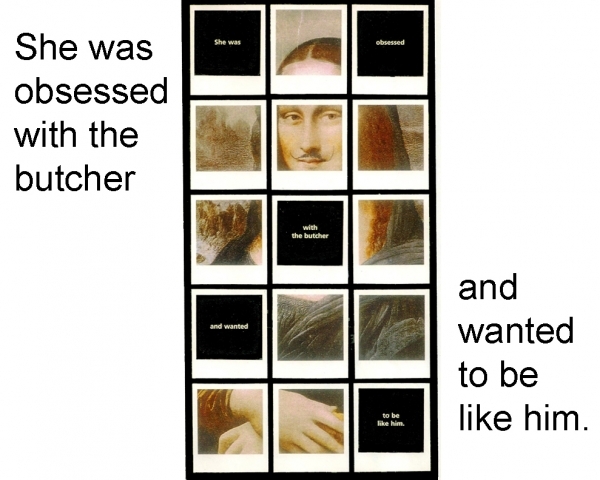 Here of course, I have taken Duchamp’s alteration of the Mona Lisa as my starting point. Following my usual procedure, I looked at the image and added a text that captured my reaction to the image. Well, I came up with such a bizarre statement that it took a few days for me to discern the meaning of my own words! Here’s my interpretation. I think that the “butcher” in my text is Duchamp, because he has “butchered” Leonardo’s masterpiece. The remainder of the phrase then makes sense, because I do want to be like Duchamp! I admire him so much! I am proud to say that this work was included in a group show at the Johnson Museum on the campus of Cornell University.